Achieving stealth results in the sea is not a simple feat. With the development of super advanced radar and sonar, watercraft can be spotted well in advance. Meet GHOST. The revolutionary watercraft was developed by Juliet Marine Systems, a private American company located in Portsmouth, New Hampshire. The company finally came forward about their development in Aug. 2011 when the U.S. Navy lifted secrecy orders on the project, according to a company press release. This vessel definitely has some impressive technology that can take warfare on the water to the next level. 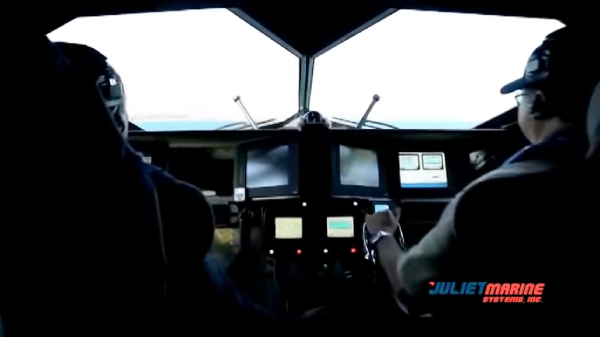 In fact, it changes everything about the marine industry and the understanding of manned and unmanned vessels. 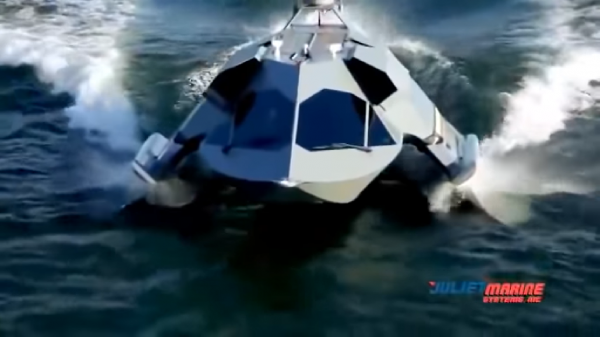 This fast attack stealth boat is a super-cavitating surface craft which is able to achieve 900 times less hull friction compared to a conventional watercraft. This will give it a strategical advantage of avoiding enemy radar, water IEDs, and other methods of early detection. GHOST can safely carry personnel and supply over the high seas at more than 30 knots. GHOST was designed to address the growing international threat of combatant swarm attacks, waterborne IEDs, and piracy. The technology is suitable for fleet force protection, special operations, ISR, command and control, and mind warfare and detection. The ship is fast, agile, long-range super submersible surface craft comprised of three main structures, two movable buoyant tubular foil hulls, and the command module that rides above the water on two thin connecting struts. Its crew consists of three personnel: a pilot, a weapons officer, and an engineer. However, it has the capacity to hold 18. GHOST was designed as a long-range coastal patrol vessel for geographic locations such as the Straits of Hormuz, the Malacca Straits, the South China Sea, the Gulf of Aden, Korea and Taiwan. GHOST has an extremely long-range to accomplish missions and patrols in these areas. GHOST can be used by the Coast Guard and other security forces for patrol, rescue, and counter-drug operations. GHOST weighs in at 40,000 pounds and disassembles into three main components. It can be flown on a C-17 and then reassembled in just 24 hours. It can be moved by rail or over the road, as well as transported or deployed using ships or the well decks of LPDs, LSDs, and LHDs. GHOST could also be sea-based from a barge. GHOST propulsion uses aviation quality gas turbine engines, providing unsurpassed reliability with 10,000 hours of operation. An engine propulsion change only takes two hours to complete. All the primary components are located underwater to protect them from enemy weapons. GHOST has the capability to operate unmanned and gets the warrior to the battle, making its design and technology a one-of-a-kind vessel.